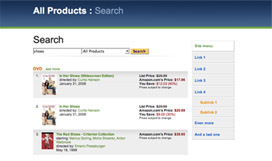 With Amazon Web Services you can create an amazon store on your own website. This way you can sell amazon products and make money with Amazon Associates. I have found Amazon to be a great way to make make money. The easiest open source option to build an Amazon store that I have found is Amazon Products Feed. This script is simple to install and use. Just unzip, upload in ASCII to a directory, and then CHMOD amazon_products_feed.cgi (775). Then point your browser to the apf_config.cgi file and follow the onscreen directions. You can see your store by visiting amazon_products_feed.cgi and after that you’ll most likely want to use php includes to create static pages for each major page you wish to show in your store. There is plenty of documentation with the file, so be sure to read it for further details. This entry was posted on Wednesday, March 1st, 2006 at 5:20 pm	and is filed under Design, Niche Marketing, Template. You can follow any responses to this entry through the RSS 2.0 feed. You can leave a response, or trackback from your own site.